Ever had a blog post, graphic or report and lost it because you did not have proper storage and backup apps? It has probably happened to all of us at least once or twice or a couple hundred times. When you own a business, time is money and as cliché as it sounds it is the truth. Your time is precious and having to redo that file you just lost is too painful. Luckily, we have put together a list of our go-to storage and backup apps. In order for you to better navigate through this post, we have created a key for clear understanding of where we stand with these. 👍🏼 = currently using and loving it. | ✅ = tried it but not currently using. | 📌 = interested in trying out. Disclosure: This post may contain affiliate links, which means we may receive a commission if you click a link and purchase something. 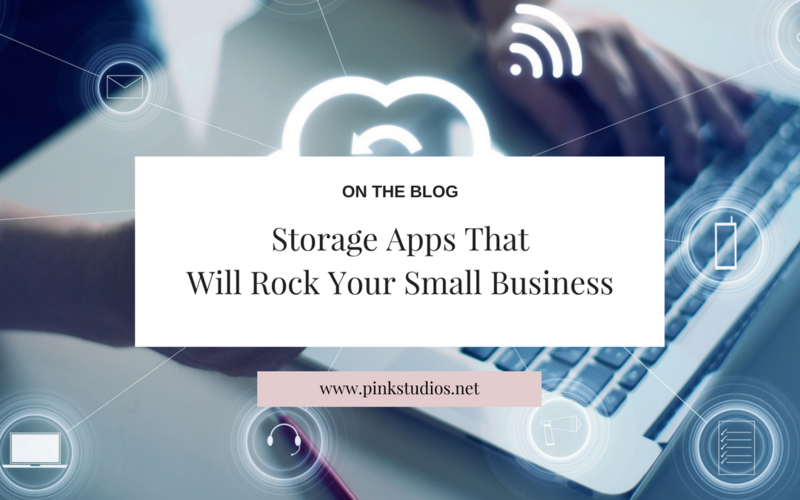 Looking for storage and backup apps to rock your business? They’re here! At this point, probably we have all either used Google Drive or a Google product. Google Drive comes with many other apps included when you sign up for a Google account such as: Sheets, Docs, Slides, Calendar, Groups, Google+ and many more. Do you have a Google account but no clue on how to access your Google Drive? The direct link would be: drive.google.com. Google Drive is a great storage and backup app since it is easily available on Windows, Mac, any browser and it even has a mobile app for Android or iOS. Once you are in the app, that’s where you get creative and decide the best way to organize this for you and your business. Once you have established your structure you can invite others to participate. You can grant access per file or per entire folder; you can also decide whether they’ll have view, edit or comment. With you account you have access to 15GB included which is plenty – depending on your business. Alternatively, you can upgrade to up to 30TB (terabytes); however, having 100GB upgrade only costs $1.99 per month. Dropbox was one of the first storage and backup apps we tried when we first started our business and even though we are not super active with it; it is still helpful when sharing big files with clients. Dropbox allows you to save any type of file and sync them between devices. When you download Dropbox and use it for storage and backup app, your files are available on your computer even when you’re offline. Isn’t that pretty amazing? Ready for pricing and storage? The free/standard version comes with 2GB of storage and you can earn more space on your Dropbox Basic account. The paid version for individuals starts at $8.25/mo and for teams at $12.50/user/mo. Although WeTransfer is not necessarily a storage and backup app; it is a great tool to “transport” big documents to a final destination. As some of you may know, email accounts have a maximum file size that you are enabled to send per email. When you are working with large data files, hi-resolution photography, etc; those file size limitations can be a pain. However, that’s where WeTransfer comes in and saves the day! It allows you to send files of up to 2GB on one execution. How does it work? First, visit WeTransfer.com and on the left side, you’ll find a box with some required fields; there you should go ahead and type your email address, the email address where the file should be sent out to and attach the file; wait a few seconds and voilà. Visit the WeTransfer website | Cost: Free with option to upgrade as well. There’s a plethora of storage and backup apps that you can choose from. The most important thing to remember is, that it doesn’t matter which one you use, as long as stick to the one that best suits you and create a regular updating method to lower the chances of losing files. Time is money. Check out these great storage and backup apps. Remember to select one and stick to it! We’d love to hear about your favorite storage and backups apps. Do you use any of these? Which ones do you love and/or hate? Any new ones to recommend? Leave them on the comments section below. Oooo this is super helpful!! Thank you. I totally agree with you. It is really a headache when you lost your file. It will consume and waste your time. Thanks to the back up apps, files are now secured and easier to retrieve. Thanks for sharing this. I totally love this article. I am looking for storage and backup app that I can use for my business. I want to try Google Drive. I think that this will help me.